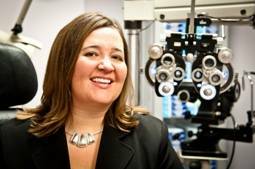 Dr. Trisha Beal was honoured as the 2011 Eyecare Professional of the Year for Canada. She earned this distinction as she was recognized for her efforts to actively promote eye health within her practice and local community. “Dr. Beal’s enthusiasm for her practice, community and the eyecare industry shines through everything she does – from working with her staff to time spent talking to moms about eye health for their families,” said Christine Underhill, business manager, Transitions Optical, Canada. Dr. Beal obtained a Bachelor of Science Degree and then earned a Doctorate in Optometry from the University Of Waterloo School Of Optometry. Dr. Beal, convinced that patients deserve to be treated with respect and appreciate receiving sincere, personal care joined a group of similar minded optometrists and became a partner at what is now known as Brant & Paris Family Eye Care. Dr. Beal was honoured academically with Canadian and Ontario Scholar Awards and Awards in Geometrical Optics. For her clinical performance, she has received awards in Paediatric Optometry and Special Needs Care, Contact Lens Services and Primary Care. She is also a recipient of the K-W Optical Group Achievement Award. In 2009, Dr. Beal contributed to the paper Fostering Healthy Sight in Canada: Focus on Kids. She has also been published in the Journal of the American Academy of Optometry, Optometry and Vision Science and was the recipient of the Backman Research Award and the Optometry faculty Undergraduate Research Scholarship. Outside her professional achievements, she was honoured to be selected and to have the Prime Minister of Canada personally present to her a Canada Citizenship Award for community service and leadership. Dr. Beal is an avid supporter of ensuring that sight-threatening eye conditions in infants are detected and treated early – before they interfere with a child’s healthy development. She has a special interest in educating all patients about the importance of UV protection and providing comprehensive eye care for patients with special needs. She is also a clinical director for the Special Olympics’ Healthy Athletes’ Program. In addition to seeing patients, Dr. Beal serves as a Site Supervisor for fourth year optometry externs from the University Of Waterloo School Of Optometry during their primary care rotations. She has also guest lectured at the University Of Waterloo School Of Optometry in their practice management course. Dr. Beal is an active member of the Ontario and Canadian Association of Optometrists, the College of Optometrists of Ontario and co-ordinates continuing education meetings for the Waterloo-Wellington and District Optometric Society.